Last year during Lent I published a series of posts on 40 Reasons Why It’s Cool to be Catholic. It was part of my Lenten penance and if you read all 40 of them, then I suppose it was part of your penance too. I’m continually surprised when WordPress tells me that people are still reading those posts nearly a year later. I remember from my secular blogging days that people love lists, so I guess the one-post-per-day format for Lent must have been a success. “Here’s the thing. Today is Ash Wednesday and I have a decision to make. Should I try it again? If so, what forty things can I write about that people will find interesting, keeping in mind that I’m going to have to keep it up for six weeks? There is so much misinformation out there about Catholics, even among Catholics themselves, that I think this will be a timely and useful series. I hope you agree. If you don’t, feel free to comment. After constructive criticism is why God gave us the “delete” button. (Just kidding.) I enjoy the conversation and appreciate the opportunity to learn something. Reconciliation. What a cool word! One definition is “the reestablishing of cordial relations.” I couldn’t have said it better myself. Reconciliation is the official name of the sacrament we used to call “confession”. The same source defines confession as “An admission or acknowledgment that one has done something that one is ashamed or embarrassed about.” I don’t know about you, but I know definitely prefer the first definition. Reconciliation is positive. Confession is negative. Reconciliation sounds pleasant. Confession sounds harsh. Reconciliation sounds like fun. Confession sounds too much like having a root canal. Hopefully we don’t need to get into the nuts and bolts of the sacrament. We all know what it is. What seems to confuse some folks is how often we “have to” go. I’d say if you’re thinking about the sacrament in terms of “have to” rather than “want to”, you’re missing the point. How often do you “have to” reestablish cordial relations with God. I suppose the answer to that would be you “have to” do that just once, right before you die. Of course, the tricky part of that is knowing when that day is. On the other hand, if you desire to maintain cordial relations with our Heavenly Father, then you can’t receive the sacrament often enough. Maybe the last time you received this particular sacrament was years ago when most priests looked at the sacrament as confession! You needed a suitable punishment for the thing that you were “ashamed or embarrassed about”. And they were just the guys to impose it. Today’s priests (at least most of them) are more into the reconciliation mindset. You’ve come to reestablish a cordial relationship and they’re here to help. 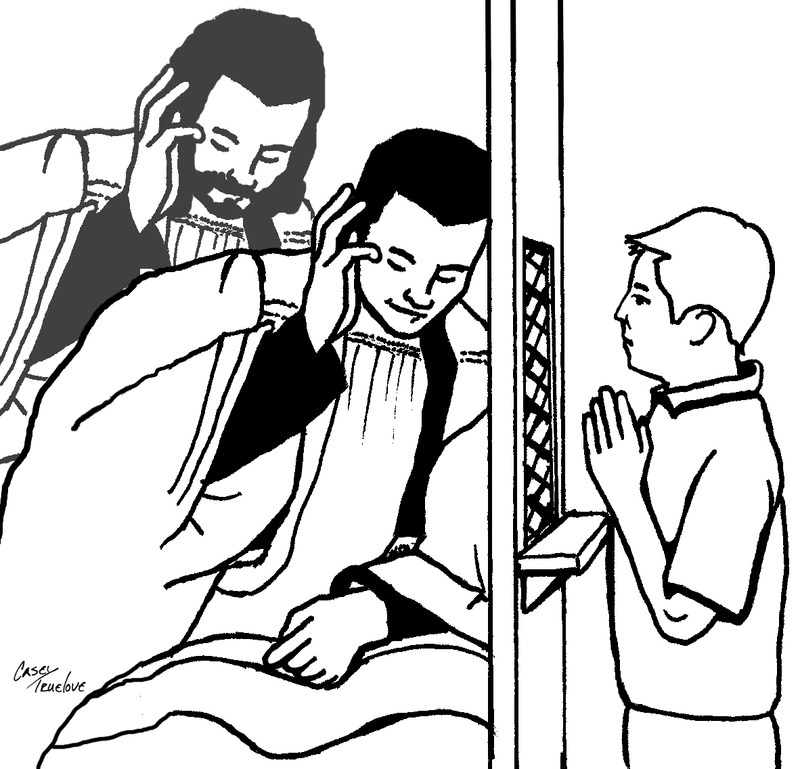 Even though we’re in the middle of Lent, the season when many Catholics think they have to satisfy the requirement to make their annual “confession”, think of it as a time to establish a new habit. That is, to be reconciled with God as often as possible. Knowing that your sins are forgiven and that you have a cordial relationship with God is more than cool. If we had the chance, who wouldn’t want to visit the Holy Land and walk the path that Jesus walked on His way to Calvary? Unfortunately most of us will never make the actual trip, so we take advantage of the next best thing; the Stations of the Cross. Wait a minute, Deacon. I remember the Stations from grade school and they were boring. There was too much standing and kneeling. It was like a really slow gym class. I won’t disagree that the Stations might have been a little tedious when you were ten, but as adults this devotion puts us right there as Jesus made the tortuous trip up the Via Dolorosa to His crucifixion. If we do this devotion prayerfully, we can almost feel Jesus’ pain as He falls three times, as He meets His mother along the way, how it must have felt to have the nails driven into His hands and feet. This devotion dates back to the fourth century but stations weren’t normally placed in churches until the 17th century. Because there are indulgences attached to each holy place represented by the Stations, there are also indulgences attached to the Stations. 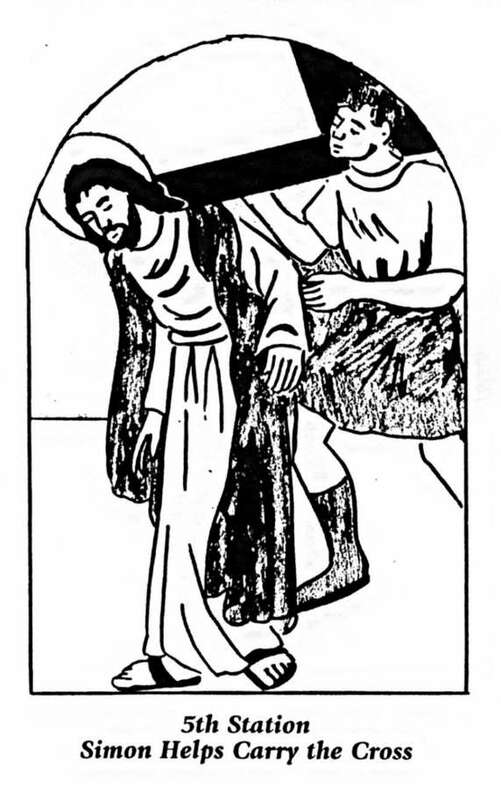 Especially during Lent, praying the Stations of the Cross is a very Catholic thing to do. Plus, if the last time you did was when you were in grade school, you’re in for a pleasant surprise. The Stations of the Cross are definitely cool! Leave it to us Catholics to turn a penance into (1) a fund-raiser and (2) a competition. When the Church said we couldn’t eat meat on Friday the parish fish fry was born. When it was decided that we only had to abstain on Ash Wednesday, Good Friday and the Fridays of Lent, we turned it into an art form. For a lot of parishes, the annual fish fry season (aka Lent) became a major fund raiser. After all, why shouldn’t we invite our neighbors, Catholic and nonCatholic alike, to join us in our annual penance and make a few bucks at the same time. Running a Catholic church, especially one with a school ain’t cheap. We need all the help we can get. A lot of people, my wife and I among them, spend the Fridays in Lent traveling to a different parish every week. We have some favorites that we never miss but we also like to try at least a couple of new ones each year. Local media run competitions, scoring free fish in the process. Besides being a good way to raise funds (even though a good fish fry is a tremendous amount of work) it’s also very ecumenical. Some folks who normally wouldn’t be caught within a hundred yards of a Catholic church have no problem enjoying a great plate of fried fish, french fries and cole slaw. Who knows when one of them might decide to convert. Hey, it could happen. By the way, there’s nothing that says fish fries have to be Catholic. VFW posts, Lion’s Clubs, Moose Lodges, and others can, and do, have great fish, some of them every Friday of the year. But when it comes to the total package, there’s nothing quite like a good ol’ Catholic fish fry. I won’t say where (mostly because I haven’t cleared it with my lovely wife yet), but we will be chowing down on some Catholic fish somewhere before this day is over. Don’t forget, Peter, the first Pope, and several of the other Apostles were fisherman. Catholic fish fries are definitely cool. By the way, fish fries aren’t the only Catholic fund-raiser. We’re also known for Bingo, trivia nights, mouse races, silent auctions, and a lot of other stuff. None of these things are exclusively Catholic, but we do them and we do them well. I think if you did a word-association test with random people on a street corner and you said the word Catholic, you’d get an awful lot of “fish fry” and “Bingo” responses. Like I said earlier, most parishes, especially ones with schools, rely on fund raisers to survive. Besides, it’s a lot of fun to get together with your fellow parishioners to put on a successful event.